Whether you’ve got Thanksgiving leftovers or you’re just hankering for the flavors of the season, this creative chili recipe is just what the doctor ordered. A perfect blend of turkey and pumpkin along with a few other traditional chili ingredients (black beans, diced tomatoes, onion & pepper), it’s the perfect way to spice up an ordinary dish. In a large skillet, heat the olive oil over medium-high heat. Add the onion and peppers to the skillet, cooking and stirring them until soft. Add the garlic and cook for one more minute. Transfer to a five-quart slow cooker and stir in the remaining ingredients. Cook, covered, on low for four to five hours. 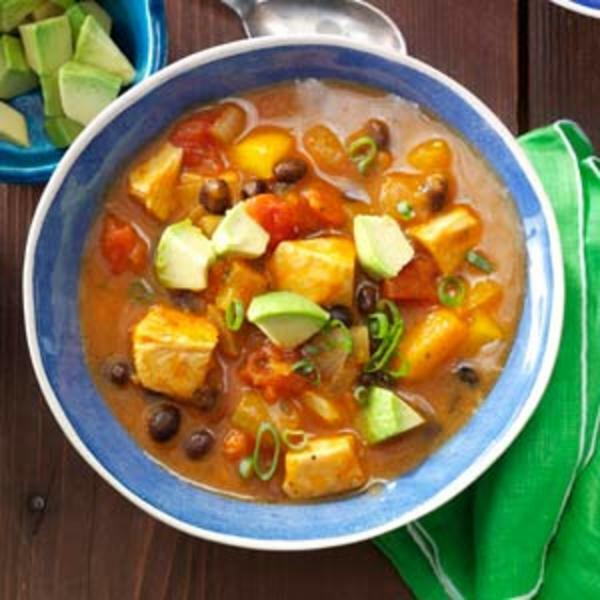 If youíd like, top your bowl of chili with freshly cubed avocado and sliced green onions.